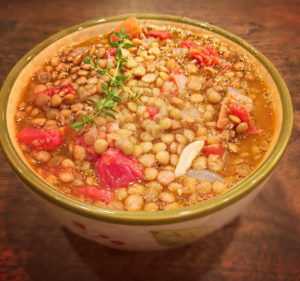 Empty the package of lentils into a large stock pot, add just enough water to cover the top of the lentils. Over high heat, bring the lentils to a boil. As soon as they come to a full boil, remove from heat, drain into a colander and rinse with cool water. Place the same stock pot over medium heat and add the olive oil. Add the onions and garlic and sauté for about one minute, or until translucent. Add the lentils to the pot and gently stir everything together. Add the tomatoes, water, bay leaves, salt, pepper and gently stir. Cover the pot and let simmer over low heat for 35 minutes, stirring occasionally. The lentils should be soft, and some split when ready. Remove the pot from the heat and If using the vinegar, you can stir it in at this point.